If you’ve been keeping up with the world of TERMINALFOUR, you will know that for the past few months we’ve been busy compiling the results of our Higher Education Web Survey that we launched back in June. We’re excited to report that the results have been compiled and are now ready to download in one handy report. This is the second annual Higher Education Web Survey and this time around we have the added bonus of being able to compare it to last year’s results. We can see what’s changed and whether or not higher education institutions have upped their game in the last 12 months. It really does provide an insightful snapshot into the current state of the web in higher education. The survey was completed by IT and marketing professionals who work within higher education institutions from the US, Canada, UK, Ireland, Australia and Ireland. The diversity of the institutions that completed the survey means we received a really good overview of what the globally common trends and differences in IT & Marketing in higher education are. The report is comprised of feedback, insights and valuable insider knowledge from 269 IT and marketing professionals in higher education institutions across the globe. What percentage of higher education institutions are measuring leads using a CRM system? How many institutions don’t have a published strategic plan? Is Facebook still the most relevant social media platform? What percentage of institutions reported that their digital marketing teams have increased in size within the last 24 months? 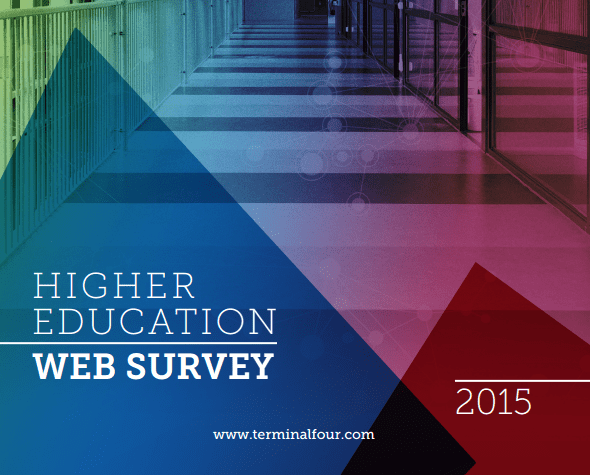 The full 2015 Higher Education Web Survey report is available to download here in a handy PDF format. We hope it helps you in your daily quest to master the web for your university or college! We would also love to hear your thoughts and feedback so please feel free to leave a comment below.